Ha ha, that title got your attention did'nt it?....well here ya go, my question is this..There is always the topic of FF on here in some form or another, but was not been adressed as much as I would like to have seen is the fact that FF is more than just retrieving, it's a whole training philosophy. Although I understand the whole FF process and it's many implications, and training procedures, I also feel it has hurt the natural retrieve in some GSP's...So for those who are proficient in FF, please elaborate on your process and the overall results on the FF. First, interested in how you think force fetch has "hurt" the natural retrieving abilities of shorthairs, or any gundog breed. That's contradictory to another belief that FF actually instills a driven purpose in a dog. Don't buy that one, either. But here's where you may be coming from: The Brits (creed, not breed) disavow advocate force fetch because they believe it can mask a deficiency in retrieving, and if a FF'd dog should be bred, that deficiency may be perpetuated. That one is a possibility, albeit rather remote in my book. Now for your take on FF as detrimental to a dog's natural retrieving ability. My mistake I worded that incorrectly, if....IF now you never know how a dogs natural ability to retrieve is, because you don't need to, because you have a FF program, say you breed said dogs over and over with no natural retrieving ability, but they can all FF like mad, and then a few hunters get a dog from you, don't know the first thing about FF and they have dogs who will not retrieve naturally. That's just my take on it. Like I said before, I understand the purpose of the FF program, I know why trainers do it, explain it to everyone else, it's not just about FF, meaning it's not just about retrieving, or am I missing something here? I have FFed for years and I have more natural retrievers than I ever have had. Interesting topic. I once heard a Lab guy mention that the incresed use of force fetch has attributed to a rise in hard mouthed labs. To a non-expert like myself it does seem to make some sense that natural retrieving abllity would get sidelined to some degree via force fetch....BUT...It would stand to reason that natural ability would still shine through on a FF'ed dog. You might be able to train a dog to retrieve that has little to no natural ability but I doubt said dog would do it nearly as well or with any of the exuberance that a dog with a lot of natural ability would. In other words I'm saying I doubt you would see too many dogs with no natural retrieving instinct FF like mad. Fwiw, however, I don't share the Brit's fears of FF masking something and believe their methods and mine are just as apt to. Not only have my FFed for generations bred retrievers readily adapted to our course of training, but a hound and a terrier with zip natural retrieve have, too. I do not know why FFing would make more dogs hard mouthed. They may just be breding dogs with that genetic tendency. First of all, you don't ff a dog unless it IS a natural retriever to start. What force fetch will NEVER do is to make a dog that dislikes retrieving into an excellent retriever. You can't give a dog that doesn't have desire, desire. FF is so involved that books have been written on it. I would suggest you buy Evan Graham's Smart Fetch if you're really interested in how and why it is done. He uses the same system I learned 30+ years ago; it works and works well. LIFE WITHOUT BIRD DOGS AND FLY RODS REALLY ISN'T LIFE AT ALL. Ok my apologies to everyone here, because I posted the natural retrieve part in there but that was not what I wanted the focus to be on, so if you can read my first post again and just omit the natural retrieve part of it.............But I do stand by that comment, and I have my reasons, sorry for confusing you all. And for whoever said the hard mouth thing about the retrievers, I think there is more to it than just that, more along the line of a retriever being considered a clamper, those dogs have more negative results from the FF program, and thats been documented by a pro for many years. Again sorry kind of off topic. What force fetch will NEVER do is to make a dog that dislikes retrieving into an excellent retriever. Ok explain to me your definition of natural retrieve? The whole process. OK, one thing at a time. First, force fetch doesn't cause hard mouth, it sometimes fixes it. Personally, I have never seen ff cause hard mouth in any dog. Period. Hard mouth is sooooooooo rare that no pro could possible document it and it's causes. Here's the deal. A dog is tough on birds and it's sent to a pro. Maybe the dog was a bird eater, maybe a sticker, maybe a crusher. I believe that once a dog DEVELOPS AND MOUTH PROBLEM AND IT BECOMES A HABIT, it is virtually impossible to cure it. You may control it, you will not cure it. Every pro I have known has felt the same way. 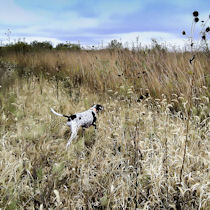 Pointing dog people don't like pointers retrieving birds, they feel it makes them harder to staunch. That may be. Keeping them out of the water prevents water freaking. Not teaching them to respond to a whistle MAY give them greater range. I think that's all rot. Get a pointer pup retrieving socks, toys, paint rollers, bumpers, birds, etc. from a pup and chances are pretty good, he'll end up being a pretty fair retriever. If you watch this and other forums long enough, you'll see that a commonly reoccuring problem is that a dog won't retrieve. That's because they won't let them retrieve. So, a natural retriever. From the time I have a pup I encourage that pup to carry toys in it's mouth. I never let them chew on training bumpers or tools. They also begin retrieving. A natural retriver should roar out to a tossed object. Whether or not he picks it up is irrelevant. To pick that object up and return with it is training. To run out to it is the retrieving desire. If you have a dog that has NO interest in doing this, do amount of force will EVER produce a reliable retriever. You may get them to retrive in the yard, but they'll blink the bird in the field. When you hear about force fetch awakening a latent desire in a dog to retrieve, that is true, sometimes it will. With a dog that given a chance, may have been a good natural retriever but hasn't been given the chance, ff will sometimes wake that up and the dog will become a retrieving maniac. FF CAN awaken a latent desire, I CANNOT CREATE desire. What force fetch is really about is it's ability to establish a training attitude with a dog that lets that dog correctly and effectively accept pressure given it. It teaches dogs in an organized manor how to turn pressure off by complying with a training command. Ok first thing, clamper is what I was referring to in retrievers, and it is Mike Lardy....he's seen enough to document it. I asked this question so that those who see all the FF answers on here, realize that it's more than just about retrieving..I understand the FF process. That was what I wanted to hear, and your thoughts on the process this establishes in all of it's training. I believe you can achieve a great retriever thru FF on a dog with no natural instincts to retrieve. I do not believe there is any way of knowing on that dog if it is awaking his natural instincts or if you have a great "trained" retrieve. Its always been my understanding that is where FF got started, training dogs without any natural retrieving instinct to retrieve in a circus act or where ever. I know that is how they train many dogs today for obedience work. And many of those dogs don't have a clue what retrieving is. gonehuntin' wrote: OK, one thing at a time. First, force fetch doesn't cause hard mouth, it sometimes fixes it. Personally, I have never seen ff cause hard mouth in any dog. Period. Hard mouth is sooooooooo rare that no pro could possible document it and it's causes. Here's the deal. A dog is tough on birds and it's sent to a pro. Maybe the dog was a bird eater, maybe a sticker, maybe a crusher. I believe that once a dog DEVELOPS AND MOUTH PROBLEM AND IT BECOMES A HABIT, it is virtually impossible to cure it. You may control it, you will not cure it. Every pro I have known has felt the same way. Ok This is nearly what I took as the guys point. No it was never stated that FF CAUSED the hard mouth. Mearly that dogs that should not have been considered desirable for breeding because of mouthing issues were being bred because FF was able to bring the mouthing issues under control. Once the mouthing issues or hard mouth was under control a undesirable for breeding dog would have a better chance to prove itself desirable to breed. A chance that it would not have without FF. Once bred perpetuating the problem thus increasing the number of hard mouthed dogs................This of course is assuming that the mouthing problems are hereditary in nature which I'm sure is debatable. Of course I'm no expert and in no way make any claims to be. I fully realize that I'm missing some of the finer points on the subject. The possibility just seemed to make a certain amount of sense to me and seemed worth discussing and in keeping with the topic. snips wrote: I believe you can achieve a great retriever thru FF on a dog with no natural instincts to retrieve. I do not believe there is any way of knowing on that dog if it is awaking his natural instincts or if you have a great "trained" retrieve. ezzy333 wrote: Its always been my understanding that is where FF got started, training dogs without any natural retrieving instinct to retrieve in a circus act or where ever. I know that is how they train many dogs today for obedience work. And many of those dogs don't have a clue what retrieving is. What's mitigating about these comments is pointer people have, apropos obedience, such a lowered bar for "great retriever." "Great" as in pointer great, maybe FF can accomplish. But these dogs, especially Britts, are bred with retrieving instincts that aren't usually roused--NAVHDA requires it and they're certainly capable of it, believe Rick even nicknamed his last Britt the "spotted Lab." Don't think force fetch is what spurred him to come up with that nickname. GH was spot-on and we differ only in his belief that *all* gundogs should be force-fetched. I believe only that my own dogs should be FF'd. It's down to choice. Ezzy and Snips; you have to realize the tremendous difference between a circus dog retrieving a dumb bell, and a bird dog that HAS to dig out a tough cripple when he has no interest in doing so. With a dog like a circus or obedience dog, the dumb bell is there, they don't have to find it. There is a HUGE difference between a dog picking up an object that both of you can see, and a dog having to search for, then recover, an object they have no interest in. I know the difference in a dog retrieving a dumbell and digging out a bird. That is what FF is about, bringing about a dog that has no interest in retrieving. Be it a dumbell or bird. And being "happy" about it If FF is done right that dog should dig a bird out "it does not see" or go to the end of the earth to find one. My old dog Ginger now going on 15 lived to retrieve wild birds shot over her & I never saw another dog beat her to a retrieve but if you threw sticks,dummies,balls, or what ever she would look at you like you were stupid.I'm sure FF would have taken care of that but I don't hunt balls,sticks,etc,her pups & Gr pups will retrieve anything & never been FF.They will retrieve fence post's,balls,dummies,you name it & will do it with energy & gusto,tail wagging all the time.Star being trialed with Chris Goegan excels on her call backs & puts ALL the FF dogs to shame there she amazes even him.Why would we mess with that? I can attest to that Ted, having seen more than one of your dogs, they are the retrievingest (What? Is that even a word) "bleep" things I have seen. I agree with you Ted, but to many, and this is the point I was trying to get some of thses FF pros to explain, alot of FF programs are more than just about the retrieve, it's about the building blocks it establishes throughout many different training exercises, I am no pro at this that is why I asked the question. 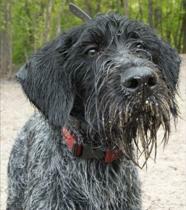 Ask many shorthair pros and they will tell you that the retrieve in the gsp has diminshed some within in the breed, directly or indirectly related to FF is the question. Brenda I am sure you and I have talked about this through email or something at one point, you can have random dogs within a litter not retrieve naturally at all, come from 2 very natural retrieving parents and throw all his pups a natural retrieve, it can vary. And I am sure you get enough of your pups back in for training that you can evaluate alot of those behaviors and traits, thats the beauty of having good sound breeding programs, alot of pros get them back in for training. Chip you know we have talked about this before.I know that FF is or can be more then just about retrieving,I have heard that some trainers teach it before other things to see if a dog can handle the pressure before going any farther.Chris does FF last & all her other training has went well & she retrieves like crazy, I think he was skeptical about it in the beginning but he always tells me how well her call backs are,says she just puts everything else to shame so no need to fix something that is not broke. Well I for one do believe it affects the breed's future as the breeding selection is not focusing on that. Our old girl Katie is an obssessed retriever. She has more drive for this activity than any other GSP I have had yet. I think I could fairly say she has more drive and desire to retrieve than my Lab also. Katie has never been force fetched and is not perfect retriever, but her msitakes are few and far between now. I would not hesitate to tell you that she has a very strong retrieving drive and may be able to pass that along. 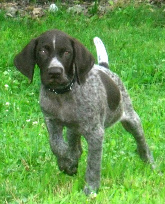 I once had a GSP girl for about ahlf a year. This dog had that same intense drive to retrieve, naturally. Both dogs would go to the absolute max! to get that item or bird back. If it was swimming, or jumping from 10 feet into the water, or trying to climb a tree, and jumping 5 feet over a fence... they were getting that dummy (or bird, or stick, or whatever) no matter what!!! My other GSP' then have been fine retrievers with a natural retrieve that is able to be developed nicely, but before the FF they will balk at some situations perhaps. For a bird, they would do it, but I feel that is really bird drive ADDED to the retrieving. Our DD would barely even play retrieve at all. He will retrieve a bird in the upland situation, and do it extremely well, but I am not sure at all that if you shot a duck and he had to break ice, jump a fence, and then do the same in reverse that he would get that duck back to you. If he did, it would be sloppy, and you had better hope the duck is dead because he would drop it and pick it up alot. You may argue that that is where FF fixes the details, and that is somewhat true, BUT Katie would never drop a bird, or a dummy. Getting thet item back to you is paramount and with no FF she would never drop it on the way, or dally! She can be a bit hard mouthed if the bird is very mangled already. Back to the DD, There is no way without FF that I could ever do drills or practice having him wait for a retrieve and then send him. He would just get bored with it. He might now do a few since he has discovered real bird retrieving, but He does not have the PASSION. You could argue that he has natural ability because he retrieves at all without FF, but I believe that is missing the point. The real natural retrievers LIVE to play this game. They would go around the world for a retrieve and you have to train a stop command in case you ever have to KEEP them from going someplace they shouldn't for a retrieve. I do think and have stated before that FF hides a lacking in the natural passion to retrieve. Sure you may have a pup that shows some desire, but only makes a few easy retrieves in the yard. Any dog can be trained to retrieve, and love it, but those selectively bred for this drive should show a natural passion for it that is astounding. My sheltie had way more passion for retrieving that my Drathaar. Her play retrieving is what I often used to build the drive up in my GSP's that I adde dto the family. Does that make you bristle, and you think that's not a fair comparison? Well it is what it is. But it should not be that way. Do I think that because you FF, your dogs lack a natural retrieving passion? Certainly not. But they could and I would not know. They could have been like our DD who would do it a little but then quit and you FF'd them to have to, and then they eventually discovered that it was fun and grew to love it. That is not at all the same. But I have seen it in labs for sure! I will always hope that an extremely well bred hunting dog could go to an owner who is loving, kind, and firm but knows little about training a bird dog and still make a great hunting dog for them. If the pointing, holding, and retrieving were as natural as they were with our first birddog, then that would be no stretch. I feel like I am seeing the hunting dogs going the other way. That the dogs HAVE to be trained to hold long enough and don't "retrieve until your arm falls off" anymore until after they have been FF. Jake the club dog was 8 months old when we put him on his first birds. Within two short hunts he was holding to flush and retrieving. To be fair he was never good at backing. This was on pen raised birds. To say that force fetch is detrimental to a dog over time (masking traits) is to say that the electric collar and check cord are used to mask breed faults. Doesn't make sense to me. Drive is one thing, in any form, retrieving, breakaway, hunting, that we can never develop in a dog that doesn't have it. God gives it, we channel it, at least in my opinion. mountaindogs wrote: Do I think that because you FF, your dogs lack a natural retrieving passion? Certainly not. But they could and I would not know. I pull out one quote to put extra emphasis on it. Of course, "you" is general not anyone in particular. This is so true. And that is where the problem exist. FF is fine when it is needed but when someone is looking for a dog to breed to, it is impossible to tell if the dog had natural retrieving qualities or not. Just another thing that makes it harder to choose where to go. Guess it is just me that still thinks a hunting dog finds game and brings it back. I thought the whole concept of force fetching was created to get dogs to retrieve that didn't have the desire or instinct to do so. I don't profess to be an expert or to force fetching as many dogs as I'm sure some of you have, but I have a few. One pointer I had in particular had none, zip, zero desire to pick up, hold, carry or look for a bird (or dumbell). The time after force fetching he was a tremendous retriever that would look for a dead bird for as long as I wished. He also ended up being very soft mouthed which I attributed to the progression of objects thru the force fetching. I can't say for sure if he loved retrieving for the sake of retrieving or if it was pleasing me that made him happy but the way is tail wagged and his eyes lit up when he brought the bird back he sure didn't hate it. As for hurting the breeds I do think that continued breeding of dogs that have no natural desire to retrieve could certainly hurt them but not force fetching itself. I believe many people force fetch dogs that do retrieve to have a 1oo percent polished retrieve for test and trial? I am currently FFing my third dog, (first time with smart fetch method). She has an unreliable retrieve she goes to a down bird hard, real hard but then just mouths and rolls the bird, sometimes she will bring it part way drop it and then continue hunting, I think she is a perfect canidate for FF. Her lack of retrieving is probably my fault for not developing it when she was a puppy. mountaindogs wrote: FF is fine when it is needed but when someone is looking for a dog to breed to, it is impossible to tell if the dog had natural retrieving qualities or not. Ezzy, I can flat out guarantee you that 100% of the time, I can look at a dog that is or was a natural retirever, ff or not. 100% of the time. I think the same thing you do. Every bird dog should also be a most competent retriever and any one that is not, should never be bred. ezzy333 wrote: This is so true. And that is where the problem exist. FF is fine when it is needed but when someone is looking for a dog to breed to, it is impossible to tell if the dog had natural retrieving qualities or not. Same old misperceptions, year after year. "FF gives dogs with no desire to retrieve the desire they weren't born with. FF'd dogs look just like non-FF'd dogs that have natural desire." While there is no basis in fact, the flames are constantly fanned that promote such myths and misperceptions. The following will take a few minutes to read, but is correct regarding the force fetching of retrievers and other gun dogs. “Why would I want to force my dog to do something he does naturally?” goes the frequently asked question. After all, retrievers and other gundogs are bred to retrieve by instinct, aren’t they? We would all like to think so, but many are bred just to sell, i.e. puppy mills. Many others are bred with objectives other than retrieving, such as those engineered for their appearance alone, i.e. the show ring. But our focus is on working dogs – dogs bred to do the work for which the breed was established, hunting; bringing game to hand. Why would you need to force a dog like that to do the very work he’s been bred for? You see, it’s the absence of information along with a love for the dog that drives such inquiries. It’s reasonable, and it’s a question that begs to be answered. So, perhaps this insight will help clear up some of the misunderstandings about this very important subject. Certainly, there is nothing new about people seeking an alternative to doing it – frequently because they have just enough information about it to think it’s something that it isn’t. I think it’s that word, force. A new trainer often hears that word and gets an instant mental image that sends them running the other way! It won’t go away, and for good reason. Let’s start by clearing up what force fetch actually is (or isn’t). More appropriately, there are more misperceptions than myths surrounding the process of force fetching retrievers. I think it starts with the term force. To the novice trainer/dog lover that word summons visions of a dog being thrashed or brutalized in some way or another. There are stories, some true, some contrived, about harsh measures being used to force fetch, like using bottle openers, pliers, etc. Nothing like that will appear as a suggestion in this text because it has nothing to do with how I approach it. Let’s start there and clear the air about that subject. 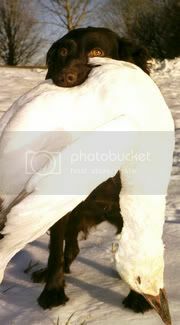 Ø	Force: In retriever training this is a term that describes the use of pressure to achieve a sure and reliable response. Influence that moves something, says the dictionary. The amount of pressure is specified more by the dog than by the trainer. Often very little actual pressure is needed. Ø	Pressure: something that affects thoughts and behavior in a powerful way, usually in the form of several outside influences working together persuasively. Nowhere in any definition of these terms is abuse or brutality, nor should it be. Like many things, force and pressure are either good or bad depending on how they are applied. Another misperception is often the assumption that retrievers do all of their retrieving functions by nature, and shouldn’t need to be forced. Frankly, about all that dogs do by nature is to chase after motion, and follow their curiosity about what they smell. We cultivate the rest, both passively and through the use of pressure. Even the most basic puppy-fetch conditioning we all do to get them started is an act we contrive. These dogs retrieve out of self-centered impulses. Bringing birds to us is not a nature-driven act. Thankfully, it can be easily engineered! Take a well-bred pup and turn him loose in a fenced yard for three years, or so. Leave him strictly to the influences of nature. Then go out one day and see how well he does on the type of retrieving work that would make him useful in game conservation. Compare his work to even an average gun dog with amateur training. How do you think it would come out? No brainer! Whatever natural gifts a dog may have, without some kind of guidance they will tend to be of little value. It’s not a negative statement that retrievers need training to do the work we need them to do in the field and marsh. That type of work requires a dog to have good natural abilities, but also to be taught how to put those abilities to work because the skills and functions we require are our idea. We invented them. It’s okay. That’s why dogs and trainers are so often referred to as a team. Both contribute to the effort. First of all, force fetch is more than just one thing. It is a definable process with clear goals. But, within the process are several steps or phases. Those steps will be laid out later, but first let’s examine the goals. 1. To establish a standard for acceptable mouth habits. 2. To provide the trainer with a tool to maintain those habits. 3. To provide the trainer with a tool to assure compliance with the command to retrieve. 4. To form the foundation for impetus (momentum). Mouth habits include such important items as fetching on command, even when your dog may be distracted, or moody, or any number of things that might interfere with compliance. Sure, you may get away for years without having such problems, but being smart and being lucky are not the same thing. Force fetch gives you a tool to handle this when it comes up, plus some insurance that it is less likely to come up due to this training. Along with compulsion issues we need to mention a proper hold, and delivery on command. If my pheasant is punctured I want it to be from pellets, not teeth. That actually covers some ground in all of the first three categories. Let’s spend a little time on number four. Lots of people use the terms momentum and style interchangeably. I think it’s important to distinguish between the two because of how they relate to this subject. Force fetch is the foundation of trained momentum, and provides a springboard into subsequent steps of basic development. Style has little to do with this. Here’s why. Ø	Style: A combination of speed, enthusiasm, and just plain hustle that you see in a dog going toward a fall. Style is the product of natural desire and athleticism. Ø	Momentum: In a retriever, the compulsion from the dog’s point of origin; defined in the dictionary as “the force possessed by a body in motion, Measure of movement: a quantity that expresses the motion of a body and its resistance to slowing down. It is equal to the product of the body’s mass and velocity”. Clearly, this quality is a tremendously valuable asset in the running of blinds and overcoming diversion pressure. It even applies to running long marks, and/or marks through tough cover or terrain. When you need a dog to drive hundreds of yards against the draining influences of terrain, cover, re-entries, and all of the real and perceived factors that are so commonly momentum-robbing, having a dog with a reservoir of momentum is immensely valuable. Force fetch is where that reservoir is established, and can be built upon. From the foundation of a forced fetch most modern methods progress through stages that continue to build on this principle. Stick fetch, Collar Condition to fetch, Walking fetch, Force to pile, and Water force are all extensions of the work we do in ear pinch or toe hitch, which are popular means to get it all going. When a dog has finished such a course the result is an animal far more driven, with much more resolve to overcome obstacles and distance and distractions. I am not suggesting that we harm or abuse dogs in any of this force work I’ve spoken of. The late Jim Kappes said, “A properly forced dog shouldn’t look forced”. I completely agree. Momentum and style are distinct terms, each with their own meanings, as pertains to retrievers. I firmly believe that both are traits that should co-exist in a well-trained retriever. I was hoping to get some insight into force fetch, even more so since Evan is here. Lets not let this thread die yet. I must be stupid but I get the impression this was written to refute what I am quoted as saying and I don't see a thing that does that. A dog that has been FF properly will look just like a dog that fetches naturally. That and that alone makes it impossiblre to tell the difference between them. And when I am picking a dog to breed to I want to breed to a dog that is natural. That is all I said and I think it still stands. I didn't say or indicate that FF was bad, just that it does mask some shortcomings that I would prefer to not brred to. A dog that has been FF properly will look just like a dog that fetches naturally. That and that alone makes it impossiblre to tell the difference between them. And when I am picking a dog to breed to I want to breed to a dog that is natural. That is all I said and I think it still stands. I didn't say or indicate that FF was bad, just that it does mask some shortcomings that I would prefer to not brred to. What you state is ONLY true If the force fetched dog was a natural retriever in the first place. If a dog has no retrieving desire and is force fetched, anyone can pick them out in an instant. Tails between their legs, ears back, a slinking motion to the object and they will blink a bird whenever possible. All force fetch does is to polish the pick up and delivery, it can never instill DESIRE in a dog that has NONE. BUT, as i said earlier, force fetching teaches a dog to handle pressure and how to turn off pressure with a correct response and that goes way beyond the retrieving part of the game. It gives the dog confidence. It teaches the dog to listen to you, the trainer. It will focus the dog on the job at hand. it will bring out what genetics put into the dog with style. one should never go into FF'ing a dog with the attitude it will add drive, desire or help the dog to "fetch" because it wont. alot of people ruin good dogs taking the wrong approach about FF'ing when they FF their own dogs and try to "make the dog fetch" with FF. that battle is either won or lost with breeding and early training. I think you guys need to go check out an obediece ring sometime if you think you can't force fetch a dog with no desire to retrieve. And many of them do it willingly and happily. Every breed of dog in the world can be and I would guess has been taught to retrieve, natural ability or not. I also am guessing that practically everyone on here knows about FF. Some willagree with you and some won't but that is not the arguement in this thread. This one started with my desire to breed to a natural retriever and I stand by that. I sure don't want to sell my pups and have to tell the buyer that they won't retrieve and will have to be FF'd. Guess that is just my crazy idea and has lost favor in the present day breeders. It used to be a universal concept of the European dogs at least that they would point and retreive. And I think most retreiving breeds have been sold to people who think they will retrieve right out of the box. Maybe I'm wrong. This is probably just another old idea of what a pointing breed should be that is completely outdated in todays world. I don't think you're wrong at all Ezzy, in fact I think you're very right. I also believe that most of today's huting breeds ARE natural retrievers but are never given the chance. Owners of pointing dogs have are so afraid that if they work on a dogs retrieving ability as a pup, they won't be able to steady the dog later on to flush, shot, and fall. That's pure garbage. But as a result of that belief, many pointing dog pups are never let retrieve until they're two years old. By then, it's too late to make many of them good retrievers, their retrieving desire has not been developed, and they will NEVER develop into willing retrievers. Retrieving breeds are the same. If you let that dog retrieve nothing or very little, then at two decide he's going to be a bird dog, you're in for a battle many times. Those are the dogs you see that people say "they're not a natural retriever, I had to force him". But it was never the dog's fault. It was the gullable owner that had fallen into the trap of not developing retrieving instinct in the dog because he would be easier to steady on point. But once upon a time, those dogs would have been good retrievers had the instinct been developed in them. That's why you see me preaching on here about getting a bird dog retrieving from a seven week old pup on, the same as retrievers are developed. You also must give that dog a ton of pointing exposure at the same time though. It's all a question of a balanced exposure and training program. But to say that ff is ruining todays dogs by masking a weakended trait is just wrong. It's not the force fetch that is at fault, it's the owner that never made an attempt to develop that God given trait at a pliable age. IMO. I agree with Gonehuntin & infact stated before how do you know a dog is not a natural retriever if never given the chance.Bob Merkel,I'm sure a few of you have heard of him said either USE IT or LOOSE IT. ezzy333 wrote: I must be stupid but I get the impression this was written to refute what I am quoted as saying and I don't see a thing that does that. A dog that has been FF properly will look just like a dog that fetches naturally. No, Ezzy. I'm not indicting you personally. I'm speaking to a common misperception; That force fetch is equal to natural desire to fetch, in that a dog with little or no such desire can be made to look just as birdy and stylish a retriever through the FF process. Perhaps one in a million. 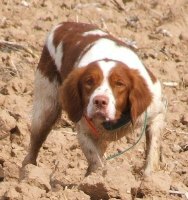 I like useing frozen quail to train my young dog to retreave; has anyone else had good luck useing this method? I may be oversimplifying the whole deal, but here is my two cents. Dogs that I have owned have always had natural point and natural retrieve from the time that they are first exposed to birds. However, we as owners refine those natural abilities. A puppy will point and perhaps even stand their birds......for a while. We train them to stand them until WE flush them. Most puppies I have owned want to chase the bird after it is flushed. We train the dog to stand until we release it for the retrieve. My interpretation of this is that.......we are training the dog to stand when it's natural instinct is to chase. After we shoot the bird, we want the dog to retrieve. This training process can create confusion for the dog.........."first he wants me to stay.....now he wants me to go." FFing teaches the dog to retrieve "on command." IMO it does not have anything to do with the natural desire of the dog.......because we are refining their natural abilities and instincts in order to meet our criteria of a "finished" dog. This was a good thread. I think only one thing will come of it though. We choose our own experts. Those that oppose the procedure will balk at it till h**l freezes over. Those that use it will defend it. FF is really no more than a tool, it can be used right or wrong. If it sounds like some kind of barbaric torture to you, your not going to use it anyway. If your on the line I would suggest you find someone that does it right and give it a try. If play training to retrieve is your thing I would encourage you to do that, it will usually work. If for some reason you come up with a dog that just refuses or has hard mouth, I would suggest you give it a try, you just might be suprised. Some people believe in using check cords and stopping and holding the dog to teach it to point. Others say favor the remote trap. 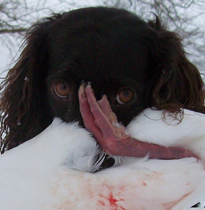 Many refuse to train on pigeons, claiming if you want a bird dog you have to train on birds. Although I'm not sure what you'd use to train a grouse dog then. Choose your expert and move along. I'm sure if you follow the advice you get from h, whatever that may be, you'll end up with a hunting dog. Just choose a dog bred for what you want to do. I pity the man that has never been loved by a dog! lvrgsp wrote: Ok my apologies to everyone here, because I posted the natural retrieve part in there but that was not what I wanted the focus to be on, so if you can read my first post again and just omit the natural retrieve part of it.............But I do stand by that comment, and I have my reasons, sorry for confusing you all. And for whoever said the hard mouth thing about the retrievers, I think there is more to it than just that, more along the line of a retriever being considered a clamper, those dogs have more negative results from the FF program, and thats been documented by a pro for many years. Again sorry kind of off topic. Everyone knows about FF but few know the philosophy or real purpose. Get Mr Graham's "Smart Fetch ' material. So if you all had to give a newbie advice on when/if to FF, what would your response be? Build up the pup's natural abilities so you are familiar with them, then if need be refine with FF at X months old? Right now my 4mon old pup will run to a ball or bumper that's been thrown and will return it to me because he knows that's going to get him a good scratch behind the ears. He'll also get bored with that after about 5 throws. I look at that as him being a puppy and he can only stay focused for a little while. Would any of you interpret that as a dog with no natural desire to retrieve? I'll tell you what I'd tell you. If your need a dog ff'd, get someone that knows what their doing to help you thru. I hear on several different forums that it is easy, do it yourself. I'm pretty sure that advice is given by people that think they forced their dog when in truth they already had a dog that was doing it. It was only easy because it went so fast with a dog that didn't need it in the first place. It is not so much a difficult thing as it is you have to keep things in order and know when to move on. When the dog drops him tail and resists, you have to stay with it. What is considered "forced" and what is considered "training"? I did force fetch with my dog and he is great.From wht ive seen THe only thing it changes is his desire to retrive (in a good way). Would say that track would be the only one you cant force your dog to do. But i havent done much compared to alot of you guys. Actually, I collar break my dogs and force them to perform all obedience commands and ff. I've always felt that first you teach a dog what you want, then to make it reliable, you force it to do it.